When i craving for matcha desserts in Hong Kong, Via Tokyo is my first option. The young owner Kosei Kamatani who also owns Ramen Jo in Hong Kong, is a successful business man but he finally decided to endeavour his time into F&B. With the succeed of the first shop in Causeway Bay, now Via Tokyo has its second branch in Tsim Sha Tsui this year. This is a review on the Causeway store. Besides Matcha, black sesame is another flavor i cannot find a reason to resist. Luckily Via Tokyo was serving a seasonal limited black sesame menu. We got the popular waffle cup with three flavours of ice cream - Hokkaido milk, matcha and black sesame. The ice cream was made of Hokkaido 3.5% milk, the texture was really creamy and silky. Matcha flavour was dense and very delicious, my partner and i coincided that the black sesame flavour was pretty strong and we enjoyed it very much. The sticky rice balls, candied chestnut and red bean paste all went very well with ice cream. 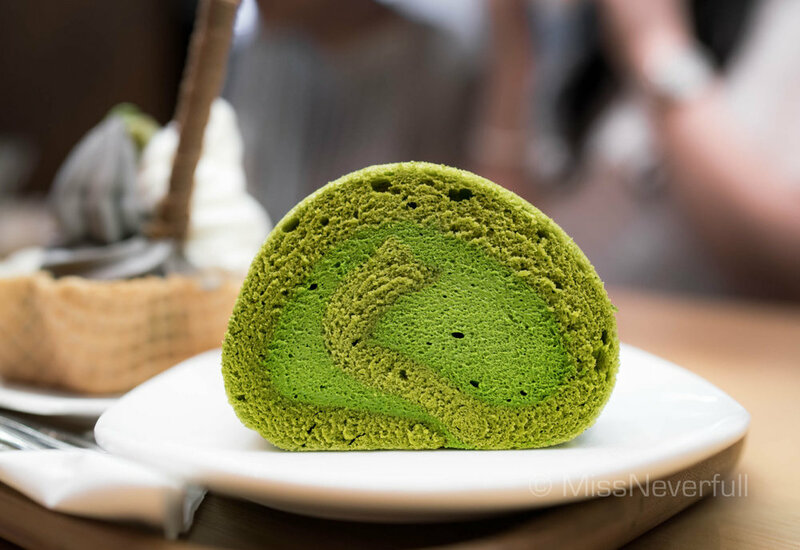 Besides the ice cream i never missed, this time tried something new - matcha roll cake. The sponge cake itself was soft and airy, i loved the matcha cream in the center which was quite light but dense in matcha flavors.